A Brooklyn-based editor, Chris Guido has cut hundreds of hours of broadcast television, countless network promos, and collaborated on documentaries for both national public television and independent producers. Chris tailors each project for the client and audience, bringing energy, clarity, and rhythm. Chris Guido is the owner of the copyright for this website. The web server used by Chrisguido.net is run by Google Cloud and is located in Mountain View, USA. On this web server 12 other websites are hosted. The language of those websites is mostly english. 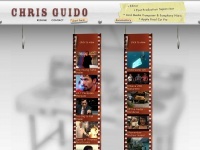 A Nginx server hosts the websites of Chrisguido.net. For managing the data of the webpages the CMS WordPress is used. The website uses the latest markup standard HTML 5. The website prohibits search engines and webcrawlers using the description of the website from the Open Directory project and using the description of the website from the Yahoo directory. Other actions by webcrawlers and bots are allowed.